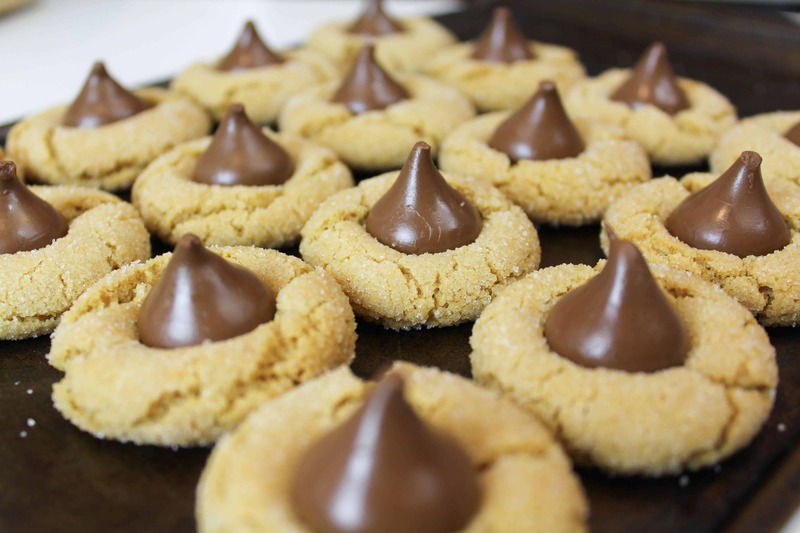 Who else loves peanut butter blossom cookies?? They’re one of my favorite holiday treats, and were the first thing I baked on my own when I began experimenting in my kitchen. I always make them with Jif® Peanut Butter , and they never disappoint! To mix things up this year, I decided to kick off my holiday baking with a cake inspired by these classic treats. I used Jif to make peanut butter frosting and cake layers, which gave my cake the same fresh-roasted peanut taste that makes the sweet and salty cookies so delicious! I decided to add some Christmas lights too, since Christmas is just around the corner. To make this cake look just like these delectable cookies, the bottom tier is made with two massive 10-inch peanut butter cake layers. The top tier is made with chocolate cake layers, frosted with peanut butter chocolate buttercream. I also carved some lines into the base of the cake, and added a sprinkle of granulated sugar to stay true to each delicious component of this cookie. Line two, 10-inch round cake pans with parchment rounds, and place a flower nail upside in the center of each pan (helps the layers bake more evenly and quickly). Grease the sides of the pan and the flower nail with non-stick cooking spray. Mix together dry ingredients (flour, baking powder, sugar, and salt) in a stand mixer with a paddle attachment until fully combined. Mix chunks of room-temperature butter and the Jif Peanut Butter slowly into the dry mix, on a low speed. Continue to mix until the mixture looks crumbly. Pour in egg whites, and mix on low until just incorporated. Mix in the buttermilk in two installments, on a low speed. Add in vanilla and oil, and mix at a low speed until fully incorporated. Scrape down the sides of the bowl with a spatula, then beat on medium speed for about 30 seconds. Divide batter evenly between the prepared cake pans. Bake for 35-37 minutes (or until a skewer comes out clean). Allow to cool for 10 minutes, then run an offset spatula around perimeter of the pan to separate the cake from the pan. Place cake layers into the freezer for 30 minutes, to accelerate the cooling process. Carefully invert the pans, and remove the layers from the pans onto a wire rack, to finish cooling. Once fully cooled, level one of the cake layers using a serrate knife. Leave the second cake layer with a dome. Set aside. Line two 6-inch pans and two 4-inch pans with parchment rounds, and spray with non-stick spray. Add the sugar and butter into the bowl of a stand mixer, and whisk on high for 1 minute. The mixture should become light in color. Add in the eggs, one at a time. Then add baking soda, baking powder, and salt. Mix on high for another minute. In a separate bowl, combine the hot water, and buttermilk. Pour in the black cocoa, and whisk until no clumps remain. Next, add 1/2 cup of flour into the butter/egg mixture. Scrape the sides of the bowl with a spatula, to ensure the flour is fully incorporated. Pour in half of the buttermilk / cocoa mixture, and gently pulse the mixture to incorporate the liquid (if you don’t, you’ll end up splattering the cocoa mixture all over your kitchen! Repeat this process, ending by mixing in the last ½ cup of flour. Divide the batter between the pans, filling each pan at least 1 inch high with batter. Bake for 25-30 minutes, or until a skewer comes out clean. Allow layers to cool in the pans for about 10 minutes, then run an offset spatula around the edge of the pans to help separate the layers from the pans. Place the pans in the freezer for about 30 minutes, to accelerate the cooling process. Once the layers are fully cooled, carefully flip the pans and remove the layers. Once the layers are fully cooled, use a serrate knife to level the tops of the layers. 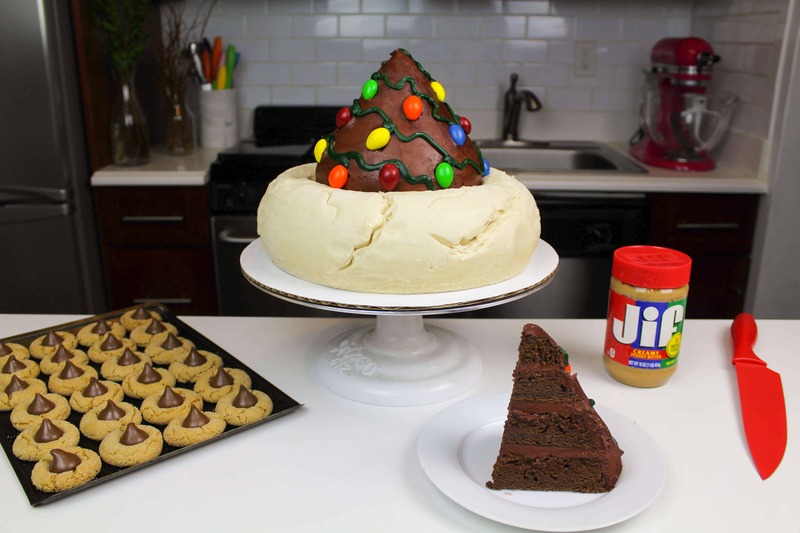 As the cake layers cool, prepare the peanut butter and chocolate buttercream. Beat the butter and peanut butter on a medium speed for 30 seconds with a paddle attachment, until smooth. Once fully mixed, add in the salt, and beat on low until the ingredients are fully incorporated, and the desired consistency is reached. If the frosting is too thick, add in additional cream (1 tablespoon at a time). If the frosting is too thin, add in more powdered sugar (quarter of a cup at a time). Place ½ of the frosting into a separate bowl, and mix in ½ cup of unsweetened baking cocoa and an extra tablespoon of heavy cream to make chocolate peanut butter buttercream for the top tier of the cake. Cover with plastic wrap, and set aside. Place ½ cup of peanut butter buttercream into a small bowl, and add forest green gel food coloring. Mix until evenly colored, then place in a small piping bag. Snip a small (less than ½ cm) opening at the tip of the bag, and set aside. 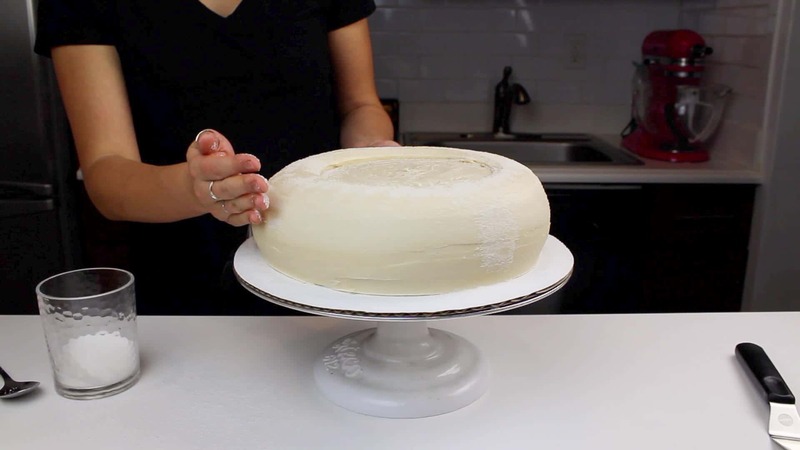 Spread a small dab of buttercream in the center of a 12-inch, grease-proof cake board. Center the leveled, peanut butter cake layer on the cake board, and top with a generous, even layer of peanut butter buttercream. Place the un-trimmed peanut butter cake layer on top of this. Cover the cake layers in a crumb coat, and place in fridge to chill. Next, begin to make the chocolate portion of the cake. 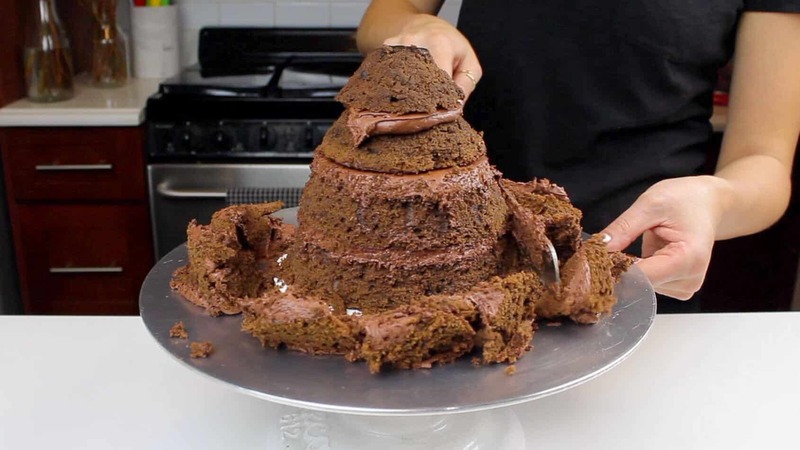 Using a 6-inch cardboard cake round, stack and frost the chocolate cake layers with the chocolate peanut butter buttercream. 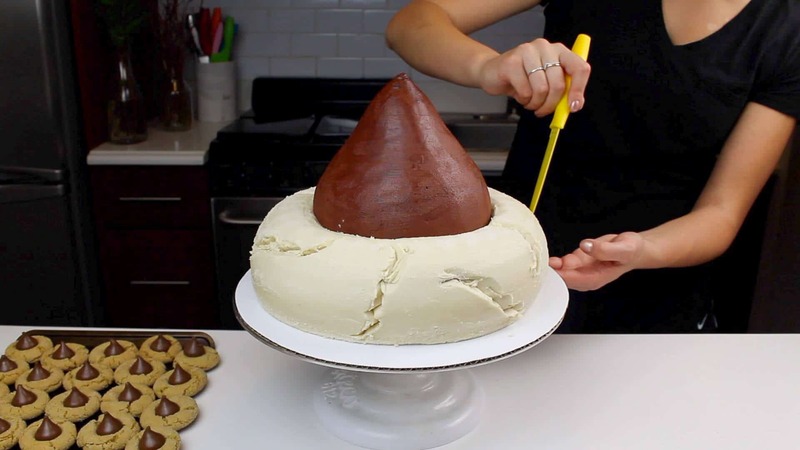 Smooth any overhanging frosting, and then use a serrated knife to trim the cake into a cone-like shape. Cover in a thin crumb coat, and place in the fridge to chill. Remove the peanut butter cake from the fridge, and add a second, thicker layer of peanut butter frosting. 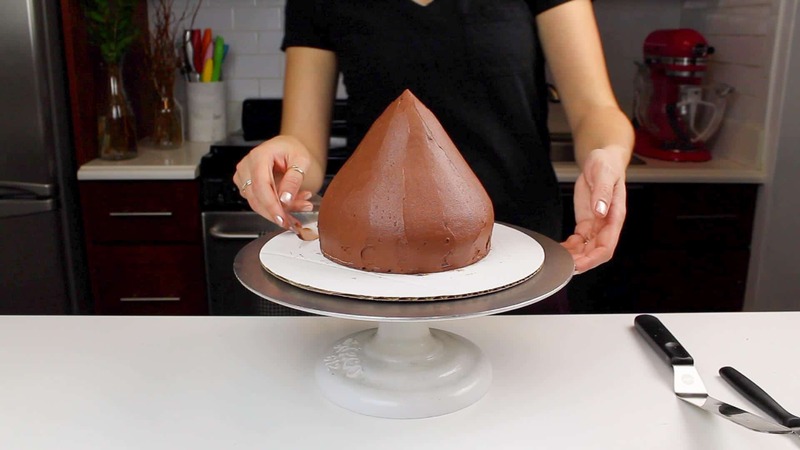 Use an acetate sheet to create rounded sides on the cake, to emulate the shape of a peanut butter cookie. Carefully add granulated sugar onto the peanut butter frosting, to emulate the sugar that peanut butter blossom cookies are rolled in before they are baked. 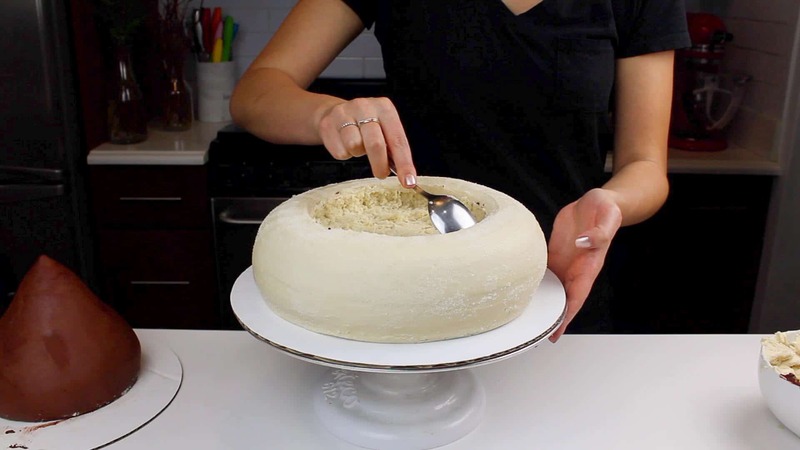 Trace the shape of a 6-inch circle on top of the cake (using the cake pan or a 6-inch cake round), and scoop out the circle using a spoon (removing about 1 inch from the top of the cake). This will help make it look like the chocolate portion of cake was pressed into the peanut butter layer, just like a peanut butter blossom cookie fresh out of the oven. Set aside. Remove the chocolate cake from the fridge, and add a second, thicker layer of frosting using the chocolate peanut butter buttercream. 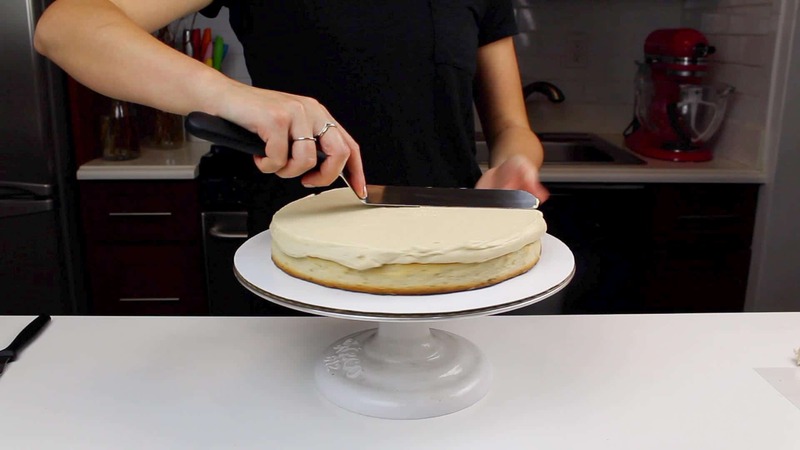 Use an acetate sheet to create slightly curved sides around the base of the cake. Once the frosting is smooth, carefully place on top of the peanut butter cake layer, into the carved area on top of the cake. Use a small knife to carve some lines into the frosting, to resemble the cracks that peanut butter blossom cookies have when once they’re baked. 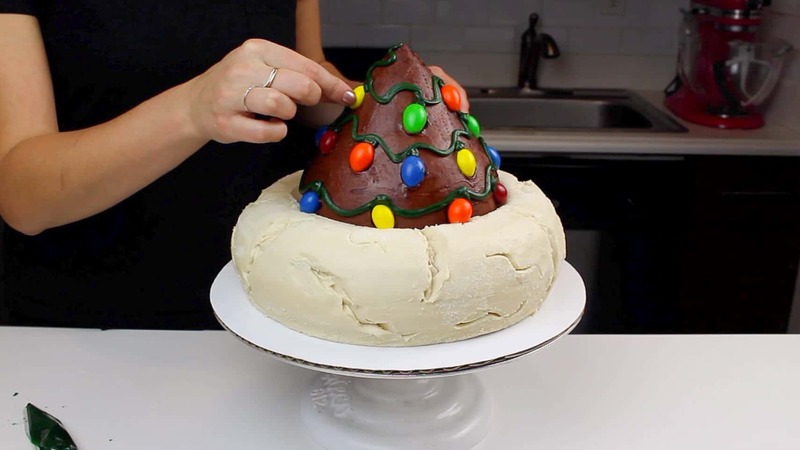 The finishing touch is to use the green buttercream to pipe a line around the chocolate cake, and place the candy-coated chocolate almonds beneath it, to look like Christmas lights! The last step is to gather your friends and family around, and slice into this cake! This cake feeds about 25 people.